Do You Explore With Your Horse? One of the best activities you can do with your horse to strengthen your bond and increase their confidence is to go exploring together. In the wild horses travel many miles every day with their friends. They get to smell, taste and see many different things together. 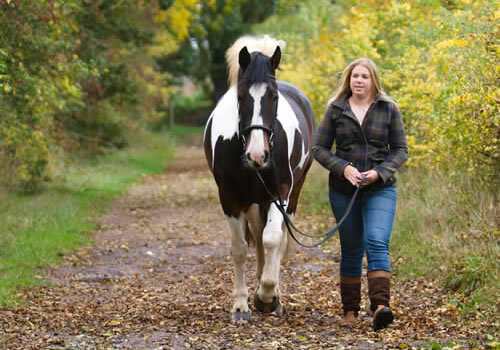 You can do something similar by taking your horse for regular walks around your local area or even just around your stable yard. Put a comfortable halter on your horse and clip on a long lead rope. If your horse doesn’t like to go out alone, go with a friend and their horse. But you will find that once the bond develops with your horse, he will happily go exploring with just you. Start with small excursions. In the beginning just a 5 or 10 minute walk is perfect. Build up to longer walks. Only go as far as your horse is comfortable. If your horse starts to get worried then return to a distance that is closer to his home and where he feels relaxed. Sometimes, if your horse isn’t used to exploring, then s/he may only be happy to go 50 feet from home. But gradually, over time, you will be able to increase this distance as your horse’s confidence grows. Allow your horse to sniff new objects, trees and the ground. Occasionally let him graze and pick at different grasses. Your horse will enjoy investigating all these new smells, tastes and objects and this will improve his ability to handle new things. Use this time to get some exercise for you and your horse. Keep track of how far you two walk on your phone or a pedometer. Even if you just walk for a few minutes every day the miles will add up. Sometimes let your horse decide which way to go. When Bella and I go for walks, I stop at the top of our driveway and let her decide if we go left or right. Giving your horse a choice will really increase their enjoyment. Exploring with your horse is an excellent way to improve your horse’s confidence and trust. You will also find that doing activities like this together will really help to strengthen the bond you have with your horse. 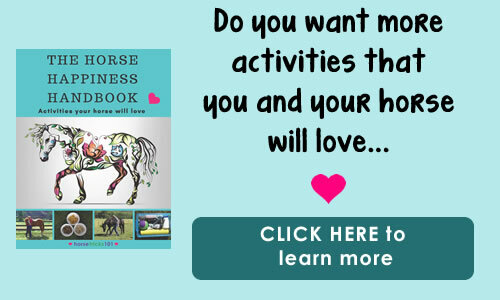 Do you want more activities that you and your horse will love!